If there is one man who was famous for his ability to endure, survive, and outlast all of his critics, that man would be Fidel Castro. Fidel Castro, before his recent passing, had been one of the most important figures in Cuban history, for he was the man responsible for completely overhauling the Cuban government and imposing a communist regime that survives to this day. Fidel Castro got his start as a young man seeking out justice for the Cuban people. The leader of Cuba at during the 1940s, was General Batista. Batista had fomented his own revolution and had taken control of Cuba, after having lost an election. His own policies were friendly to the west and he was accused of being a puppet of the United States government, as the United States had staunchly supported Batista’s administration. America had been greatly interested in Cuba for its rich natural resources and there were many American companies in Cuba, before Castro came around. Fidel Castro was desperate to be the leader of the Cuban people, and viewed Batista’s rule as illegitimate. He had greatly despised Batista’s revolution and desired change. His own party refused to back him running for Congress in Cuba, fearing his extremist views. Castro was a revolutionary from the very beginning, and made the decision that there could only be violence in order to secure control of Cuba. He began to build his own military network of dissidents and communists who desired to fight against the powers that were. Batista grew in power as Fidel’s revolutionaries prepared for guerrilla warfare. They didn’t have the numbers nor the strength to be able to outright overpower Batista and his forces, instead they opted for a progressive campaign of harassment and violence. In 1953, Fidel Castro and his allies were captured and arrested for their crimes against Batista. They had attempted to attack barricades owned by the military, only to be arrested after they had been routed by the machine gun fire of their foes. They were put on trial and Fidel along with 25 other men were thrown in prison for quite some time. Over the years, Fidel and his men grew stronger in power. They managed to flee the country, hiding out overseas, waiting until the time was right to return to Cuba and strike. More guerilla forces had chosen to hide out in the mountains, and over time, Fidel and his network was able to grow in enough strength to provide a real threat to Batista, despite the fact that Batista’s men were constantly capturing and killing the revolutionaries. Guerrilla warfare works a little differently than traditional warfare and Batista soldiers, despite being a larger force, were unable to win engagements against Fidel and his army. Fidel utilized landmines and brushfire tactics in order to enable quick movement of troops, consistently fighting against his opponents and breaking their will to fight back. As the revolutionary forces won victories, many soldiers began to defect and join Castro’s side. At Santa Clara in December 28, 1958, 300 of Castro’s revolutionaries seized the city, greeted as liberators from Batista’s reign. This was enough to scare the Batista and his political allies. The capture of the city had been quick, it had fell in less than 12 hours, prompting Batista to panic. In less than three days after the city was captured, Batista fled the country with over $300 million in cash and artifacts. Never again was he to return to Cuba. This left only one man truly in charge: Fidel Castro. Castro was a radical communist. He was a sly one, however, because he had made a point to hide his radical leanings in order to garner support from the moderates who had opposed Batista’s reign. His brother, Raul Castro, was a hard-core communist, as well as Che Guevara, one of Fidel’s close friends. Castro liked to preach about equality and the brutality of his opponent, Batista, but once Castro finally was confirmed as the leader of Cuba, his actions quickly began to show that perhaps things weren’t quite as different. While Castro believed that he was standing up for the common people, he made a point to eliminate as many political opponents as he could. With the help of his firing squads, he committed to a series of mass executions against those who supported Batista’s reign. He argued that these men were murderers and were deserving of justice by execution. The start of Castro’s reign did not bode well for international relations. Fidel Castro was a communist, and he believed in all of the trappings of a communist society e. He was relatively hostile with the West, and had a great dislike for the United States of America. Fidel’s use of firing squads, without legitimate trials, where quick to catch the attention of America. He was a man who had no problem with suppressing people who disagreed with his regime. He had utilized the many different rebel forces in his process of taking over Cuba, however as soon as he had taken over, he quickly turned on the rebels who did not agree with him. He made certain to cull all of these opposing forces so that there was only one party left in Cuba: his party. Castro’s hostility to the West was also a problem. Beforehand, during Batista’s rule, the United States had a significant amount of influence in Cuba and trade was open with them. Castro began to nationalize many of the resources, kicking out the American companies which controlled the oil. This caused America to react angrily, eliminating their sugar imports from Cuba. This only led to more frustration, due to Cuba’s reliance on exporting sugar. This prompted Castro enact more nationalization, seizing control from the American companies and ensuring that they would have no influence on the Fatherland. As Castro continued to implement more communist policies such as increasing wages for the common man and reducing wages for the wealthier, Cuba began to experience an immigration phenomenon known as brain drain. Brain drain is where a country begins to lose its educated and wealthy individuals who, for economic reasons, decide to move somewhere else. Most communist systems struggle with brain drain, due to the fact that socialism and communism inherently focus on evenly distributing wealth from other people. Those who are wealthy might not like the communist redistribution system make the decision to leave as quickly as they can. Brain drain removes the skilled, talented and educated from the country, leaving only the poor workers behind. Cuba began to suffer from a series of economic decline. As America continued to grow more aggressive and hostile towards Castro’s reign, as it was becoming increasingly clear that Castro empathized with the Soviets cause, they implemented an embargo against Cuba. This embargo was a major deathblow to Castro’s economic prosperity. Without the money coming in from US purchases, especially from the sugar trade, it was apparent that the New World was not going to get along with Castro. Castro, however, used this as an excuse to continue cracking down on political dissidents and focused on doing everything he could to remove those in his regime who would speak out against his actions. It was during 1961 that Fidel Castro declared the United States Embassy to be full of spies and ordered the embassy to reduce the number of people who are currently there. This was the final nail in the coffin for United States relationships with Castro, and Dwight David Eisenhower began to authorize the idea of the CIA overthrow of Castro and his regime. In December 1961, several CIA agents began working with a local Democratic insurgency to fight against Castro’s regime on Cuban soil. Their attempts, at the Bay of Pigs, was a failure and they were all promptly arrested. After some negotiation, the CIA agents were returned home in exchange for money and food. This gave Castro even more excuse to begin throwing political dissidents into work camps. These work camps were designed to put those whom he disagreed with into forced labor. One demographic that he targeted for these camps were homosexuals. At the time, Fidel Castro believed that homosexuality was nothing more than a deviancy and insisted on having those who were gay thrown into the work camps where they would be forced to work in order to support the communist regime. The United States was nothing except hostile to Fidel Castro. Castro, however, seemed to be relatively bulletproof. The sheer amount of assassination attempts on Fidel Castro were staggeringly high. Not only did the United States have the backing of the CIA in order to help kill Castro, they also had contacts with the Mafia, who had also been hostile to Castro for his decision to kick all the casinos out of Cuba. The sheer number of assassination attempts have been said to amount up to 638. The plans to kill him were often convoluted and insane. 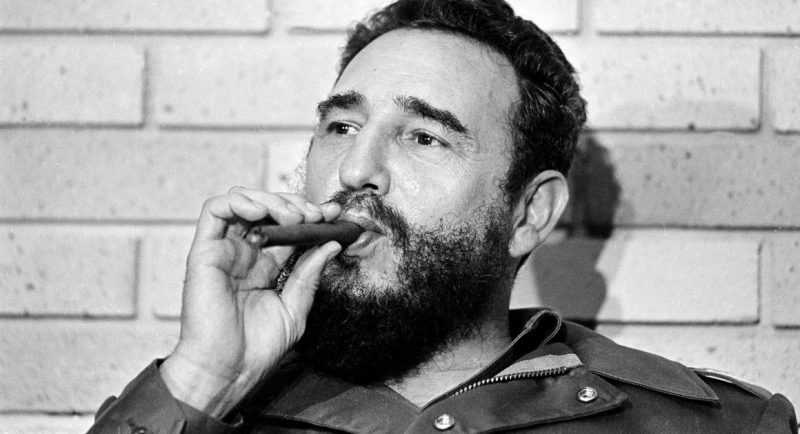 For example, there was one plan to kill Castro by poisoning a cigar of his. Another plan was to plant depth charges at the bottom of a coral reef, for they knew he liked to scuba dive. They hoped to kill the man while he was busy swimming in the waters, a plan that was massive impractical and relatively unachievable. Despite the large amount of assassination plans and attempts, they were never able to kill Castro. In fact, Castro outlived many of his political opponents. One of the tensest periods of Castro’s reign was known as the Cuban Missile Crisis. The Cuban Missile Crisis occurred when the Soviets began to consider placing missile batteries on Cuba, essentially giving Cuba nuclear capabilities. They weren’t sure about this plan, but Castro believed that this would further strengthen his country and make them a threat towards the Americans. America certainly did not like the fact that a nuclear missile site would be a mere 50 miles away from Florida, and stated that such an action would be perceived as hostile towards America. This led to an intense tension between America and the Soviet Union, who did not desire war. The Cold War was a long-standing battle of ideals between America and the communist world. Both parties had access to nuclear weaponry but both parties were desperate to avoid war. In fact, the Soviet Union leader, Khrushchev, believed that Castro was crazy enough to use the weapons. Especially because Castro was a calling for threatening a nuclear strike against America unless they were left alone. This raised tensions between all parties, but the Cuban Missile Crisis ended when Khrushchev met with the American leaders and they made an agreement to remove the nuclear weapons from Cuba. This was a slap in the face to Castro, because he had not been invited to the meeting. Castro continued his reign, still implementing the communist ideals and never once allowing for the west to bully or manipulate him. Aside from the human rights issues that were numerous under Castro’s reign, he did achieve some level of good while he was in control of the Cuban people. For example, he made a point to increase the literacy in Cuba to 99%. This is an extremely high number, and shows that Castro did indeed raise some levels of quality of life. The healthcare in Cuba was universal and has been considered a model to use by other socialist countries. On the other hand, it is hard to reconcile his actions of suppression, brutality and violence with the few beneficial things that he did for the Cuban people. As the years passed by, it became clear that the United States embargo was a failure against breaking Castro’s strength. Regardless of the destruction of the Soviet Union, Fidel Castro held onto his power tightly. It was very clear, even up to the end, he was more or less untouchable. Fidel Castro held strong, until he grew ill in 2006. With his declining health temporarily gave control to his brother Raul Castro, and later made the decision due to health reasons, the step down permanently as the President of Cuba, allowing for his brother to take his place. In 2016, at the age of 90, Fidel Castro died. He had lived a very long life, fighting against the powers at an early age, taking control Cuba and leading it, for better or worse, for the rest of his life. He outlived 10 American Presidents, 638 assassination attempts and the Soviet Union. Fidel Castro was a man with a mixed legacy, depending on who you ask. His work in healthcare and alleviating the plight of the common worker, has been received well across the world by those who have sympathy to the socialist and communist system. To those people, Fidel Castro was a hero, and the actions that he did, while immoral, were necessary to facilitate a new world free of capitalist oppression. To those, however, who fled from Castro’s rain, they were less sympathetic to his actions. As of right now, there are a great many Cuban refugees in the United States who are cheering and celebrating the death of this dictator. Regardless of how the world has seen Castro, there is one thing that there can be no doubt: he made a tremendous change in Cuba. His legacy will go in history for all ages, but whether that legacy is a good thing or bad thing, we may never really know. After all, history is in the eye of the beholder.